Thank you to everyone who joined us for One Family’s 40th. We were founded over 40 years ago in 1972 as Cherish. 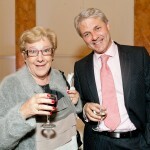 On 18th October 2013, we enjoyed a wonderful celebratory event in the beautiful Pillar Room in Dublin’s Rotunda Hospital. We recalled the past with many of our brave founders, and looked to the future as One Family. The celebration was interspersed with voices of parents from over the years, audio footage and a short video. See the full running order for our 40th anniversary celebration here. Part 1 features Mary Henry, President, One Family; John O’Connell, Chair, One Family; and Catriona Crowe, Head of Special Projects at The National Archives of Ireland. Part 2 features Karen Kiernan, CEO, One Family reading a moving message from founder Maura O’Dea Richards; and Minister Frances Fitzgerald TD, Minister for Children and Youth Affairs. Part 3 features Fintan O’Toole, Assistant Editor at The Irish Times; and actors Rachael Dowling, Helene Montague and Pauline Shanahan reading the true stories of some of our clients which demonstrate how One Family makes a real difference to the lives of the parents and children of one-parent families. 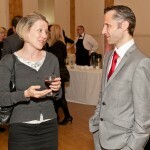 Part 4 features Geoffrey Shannon, Rapporteur on Child Protection; and Karen Kiernan, CEO, One Family. Listen to the courageous women who founded Cherish back in 1972. Here are individual interviews with founder members Evelyn Forde, Annette Hunter-Evans, Margaret Murphy, Gráinne Farren and two of the first staff members, Nuala Feric and Anna Lee. Or listen to this short three minute SoundBites audio clip of their memories. 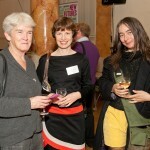 Read founder Maura Richards O’Dea’s speech which was delivered on the night. Read President Michael D Higgins’s letter of congratulation to One Family which was read out on the night. Our 40th, including interviews with our founders, featured on RTÉ Television News: click here to watch it. 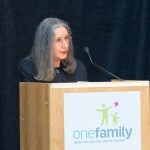 One Family founder Maura O’Dea Richards on RTÉ Radio 1’s Pat Kenny Show: click here to listen. Maura and our CEO, Karen Kiernan, are on at 34 minutes. One Family founder Maura O’Dea Richards and CEO Karen Kiernan on Today FM’s Last Word, in part 3 at 10 mins 40 seconds. Listen here. 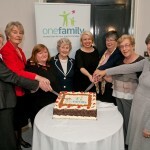 One Family founder Mary Kerrigan on Kildare FM: Mary talks about what it was like to be a single parent 40 years ago. 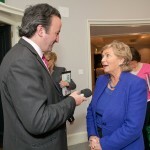 Go to www.kfmradio.com, then click on “Kildare Today” Podcasts on the left to listen. The Irish Times: Fintan O’Toole wrote a moving tribute to the founders of One Family. He commended their bravery in refusing to be ashamed of being single mothers and challenged the government to act with similar courage and lack of shame by refusing to accept the bailing out of Anglo and Nationwide. Read it here. Irish Independent: A great interview with Maura, one of our original founders. Read it here. Irish Examiner: Another fascinating interview with our founders. Read it here. To acknowledge our 40th, One Family clients shared their stories with us. Thank you to Marian Tannam, Rebecca, Katherine, Joanna, Annette, Linda, Cathryn, Cecelia, Louise, Tracey, Maria, Christine, Kiva , Melissa, Patricia, Vivien and Sheila Rafferty. You can read their stories here. Poolbeg Press has re-issued ‘Single Issue’, the moving, funny and challenging memoir of Cherish’s key founder Maura O’Dea Richards, as an eBook. It costs just €5 and Maura is donating any profits to One Family. Please support our work by purchasing a copy today. Click here to find it on Amazon.